All Aboard! The Polar Express comes to life this holiday season as the Texas State Railroad rolls out of the station bound for the "North Pole!" Come early and climb aboard with your family to cozy-up and enjoy our festively-decorated vintage train cars. Dancing chefs deliver hot chocolate and a cookie to each guest to savor while music from the Polar Express movie plays en route to the North Pole. Make sure to have your tickets handy, because your conductor will be by shortly to punch each child's ticket. Before arriving at the North Pole, the iconic book, The Polar Express is read as your Chef turns the pages to share the beautiful illustrations in the original book. 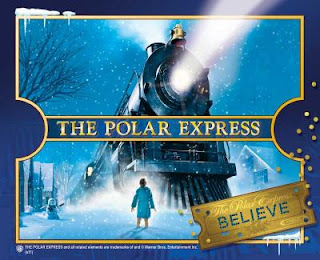 With the station far away, The Polar Express magically arrives at the outskirts of Santa's North Pole village, where Santa Claus himself and his elves joyously welcome the train! As you stay comfortably settled and warm in your seat, Santa and his helper elf board the train! During the return trip, Santa will greet each child with his signature holiday spirit and the first gift of Christmas: a bell cut from his sleigh. It is said that only children and those who still believe can actually hear the bell ring. Join in the singing as your Chef or Conductor lead Christmas caroling on the 30-minute return trip. For those wanting the magic to last or to do a little Christmas shopping, visit our gift shop in the station for special Polar Express gifts and merchandise. Oh, one last thing, children are encouraged to wear their PJ's; adults who still believe have been known to wear them, too! So, are you coming? All Aboard! All Aboard the Polar Express is coming to the Texas State Railroad, visit https://www.texasstaterr.com/ or call 877-726-7245 to climb aboard. ***Disclosure-Sponsored post. This sounds like so much fun! I stumbled on your blog and then realized you are based in Houston. Me too! I will visit again!